Lightweight, easy to use battery chainsaw ideal for felling small trees and pruning or cutting small branches. Features an intuitive keypad for safe, convenient starting, while the inertia chain brake ensures trouble-free handling. Brushless motor with savE™ mode for reliable performance and longer running time, no direct emissions, while low noise levels allow you to work in residential areas without disturbing the neighbors. CORDLESS FREEDOM: No petrol, no engine noise, no direct emissions and just a push on the trigger to go. The powerful V36 Li-ion battery pack is designed for reliable, long lasting use, designed to be recharged hundreds of times. 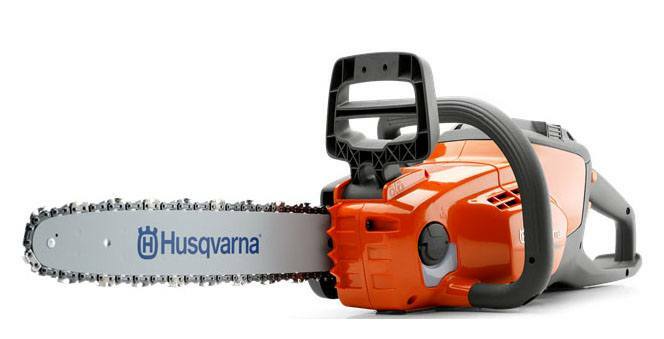 The Husqvarna battery family for the aware consumer includes both a grass trimmer, chainsaw and a hedge trimmer. ONE BATTERY FITS ALL: The BLi-battery pack is designed for recurrent demanding use. It fits all our handheld machines, which allows you to quickly switch the same battery between a trimmer, blower, chainsaw and hedge trimmer and keep working. Weight Excluding cutting equipment - 6.6 lb. Tank volume - 0.42 pt. Chain Gauge - 0.050 in.